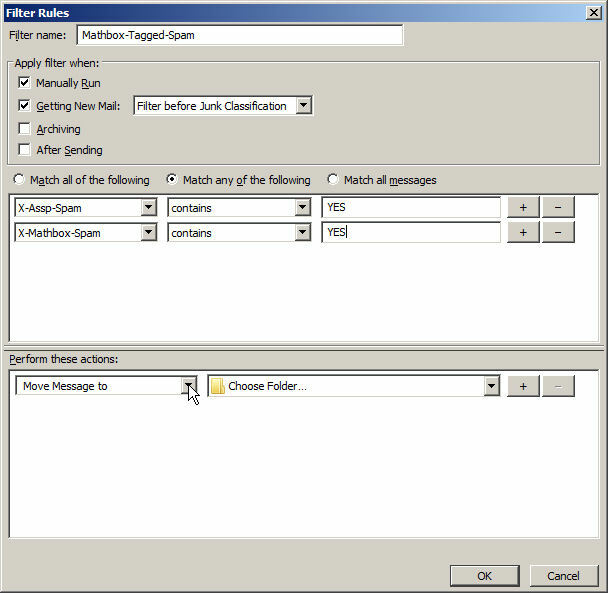 When the following instructions are completed, the Thunderbird filters will filter all incoming messages. When the filters finds a message that Mathbox has tagged as spam, the tagged spam message is moved the the Thunderbird Junk folder. This filter cleans up your Inbox, yet saves the tagged messages for review. The following instructions apply to several versions of Thunderbird. 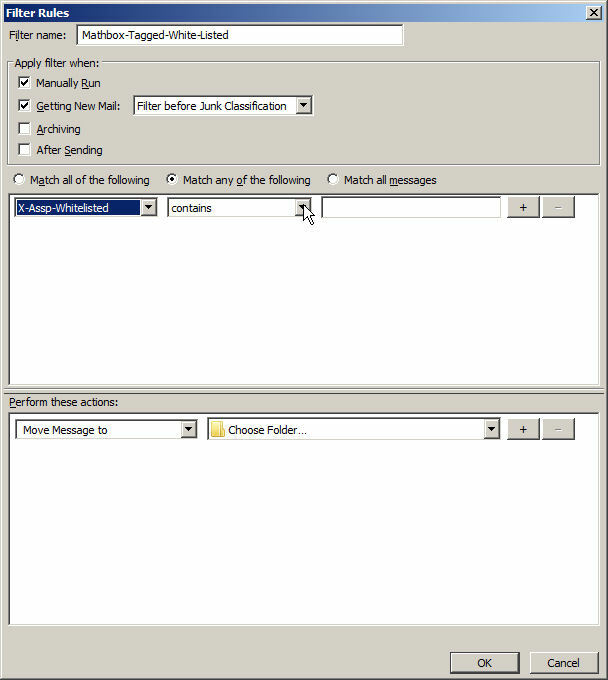 The images are from Thunderbird 38.2.0. 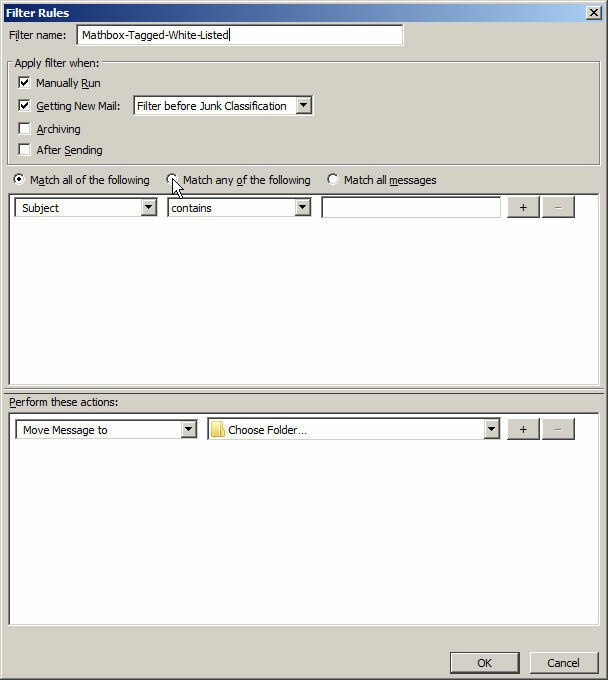 Depending on your Thunderbird settings, the Tools menu item may not be available as shown in Step 1. If not, go to Step 3. 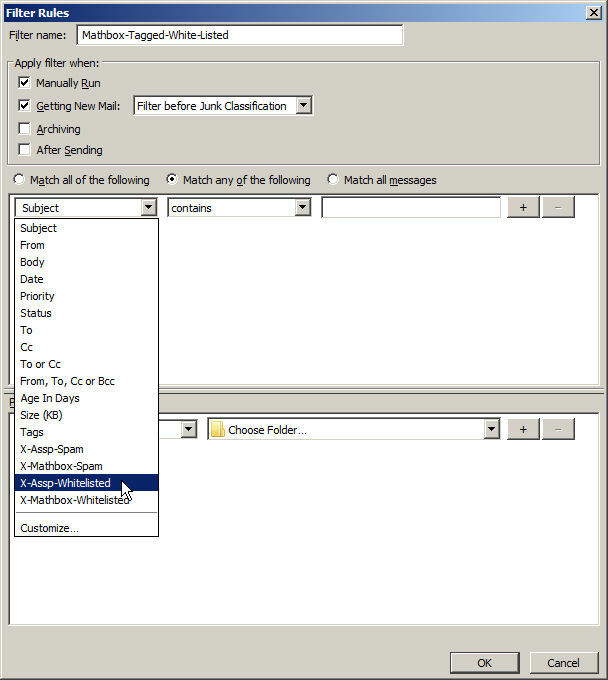 Locate and click the Tools menu item. 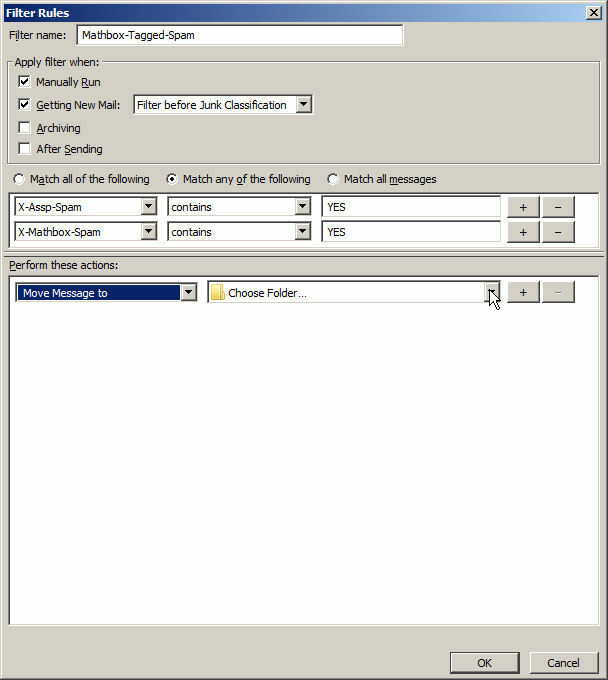 Note: you may not have the Tools menu item. In that case, skip to Step 3. 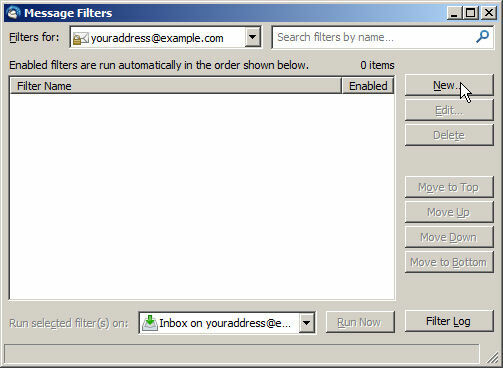 Locate and click the Message Filters menu item. Go to Step 6. 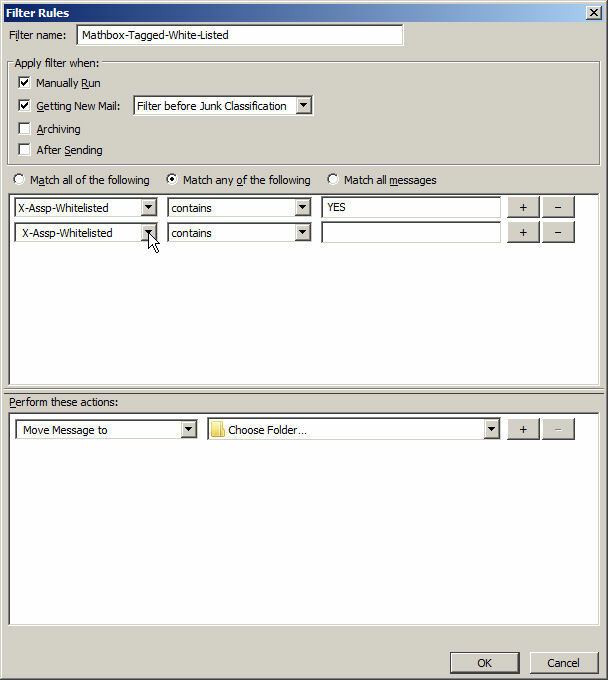 Examining the top, far right corner of the Thunderbird window, locate and click menu icon. In the resulting menu, click the Message Filters menu item, which will result in a sub-menu appearing. 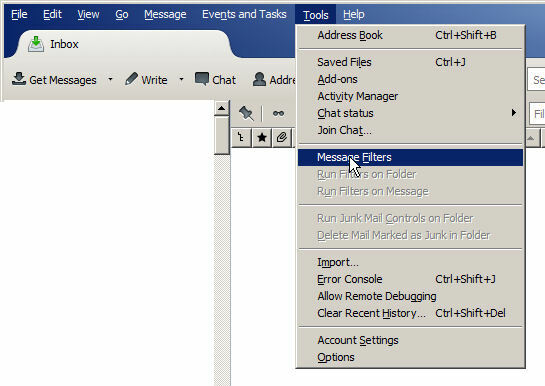 Note that in the Thunderbird 38.2.0 version, if you are slow to click, simply hovering over the menu item for 1-2 seconds will cause the sub-menu to appear. In the resulting sub-menu, click the Message Filters menu item. 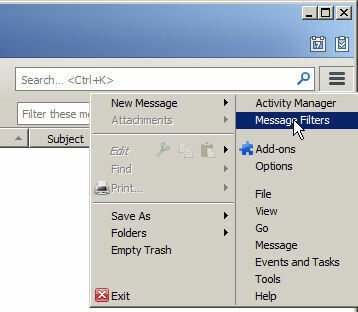 In the Message Filters dialog, locate the Filters for: select list. 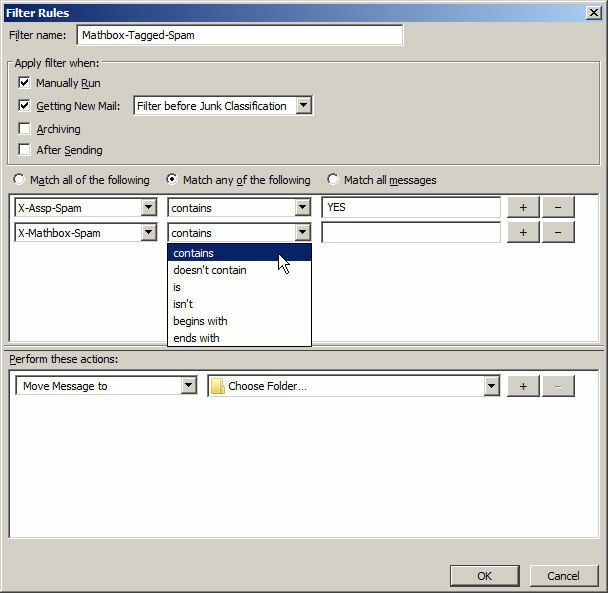 Ensure that the selected email account is one for which you want to build the spam handling filters. 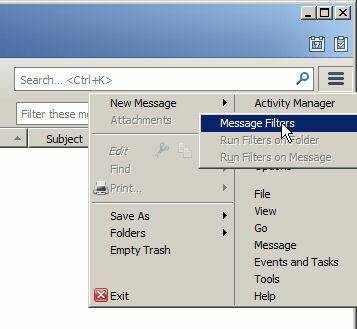 In the Message Filters dialog, locate the Run selected filter(s) on: select list. Ensure that the selected folder is the Inbox of the email account selected in the previous step above. 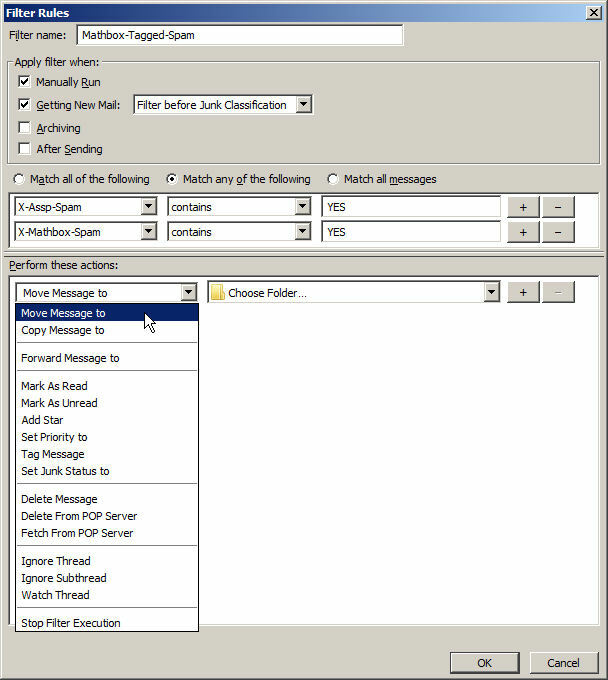 In this step, you will begin creating a spam handling filter. Click the New button. 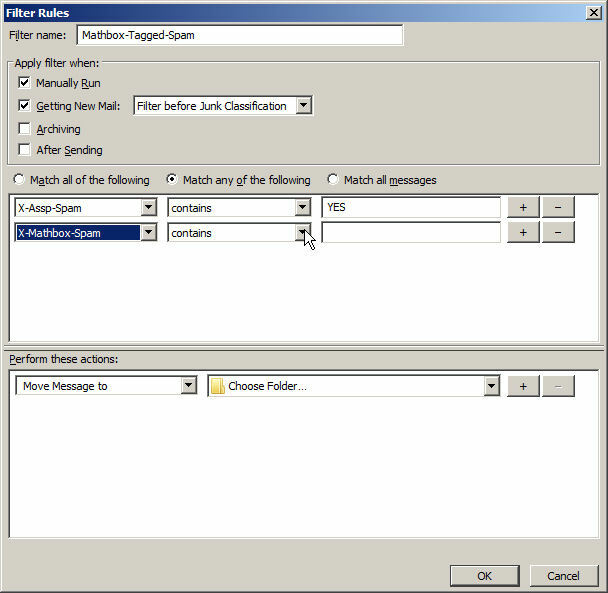 In the Filter Rule dialog, locate the Filter Name: text field and enter Mathbox-Tagged-Spam as the name of the rule. 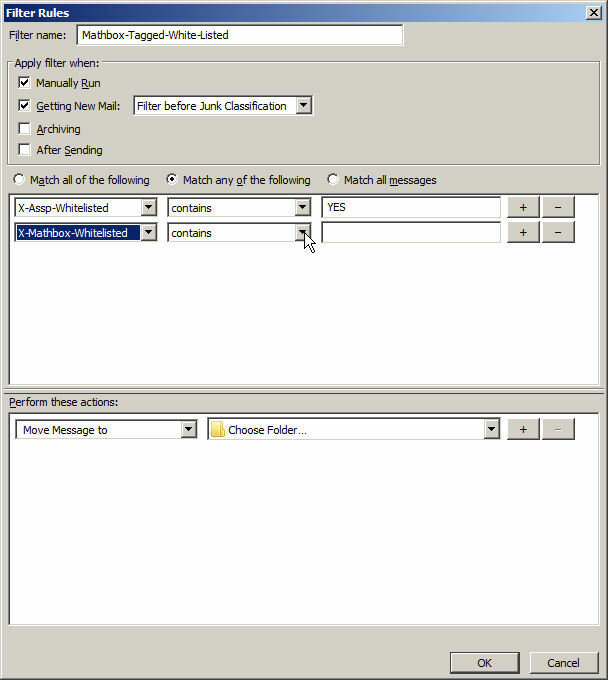 In the Filter Rule dialog, open the left-most select (Header select). 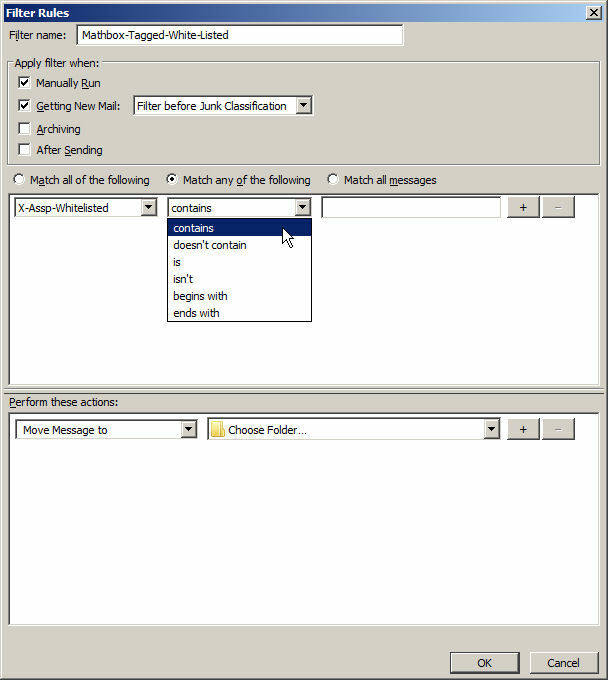 In the Header select list click on the Customize... line at the bottom of the list. 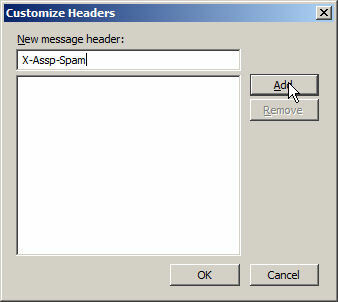 In the Customize Headers dialog, type X-Assp-Spam. Click the Add button. 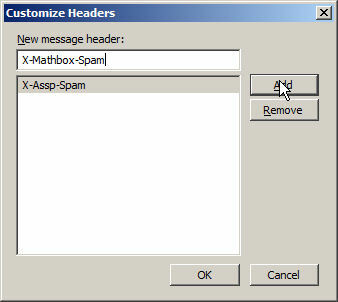 In the Customize Headers dialog, type X-Mathbox-Spam. Click the Add button. 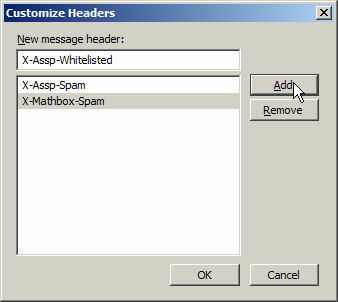 In the Customize Headers dialog, type X-Assp-Whitelisted. Click the Add button. 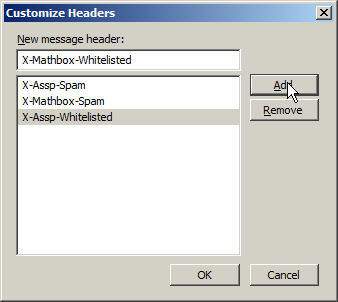 In the Customize Headers dialog, type X-Mathbox-Whitelisted. Click the Add button. 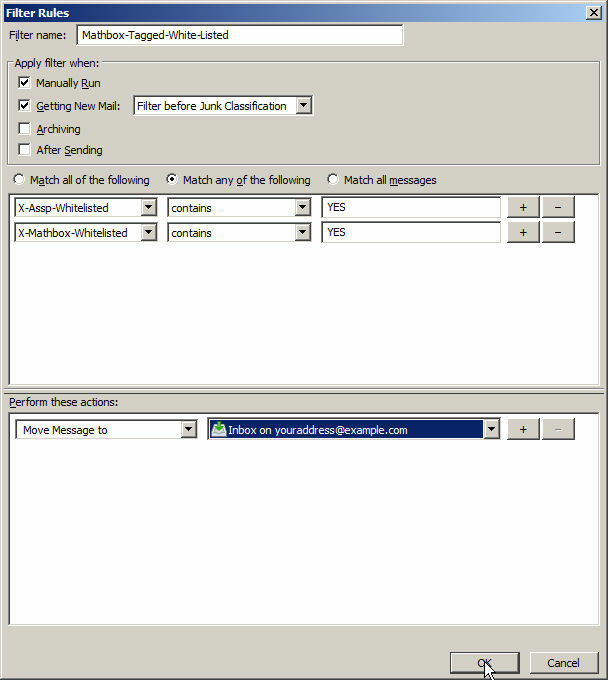 In the Customize Headers dialog, ensure that the list of custom headers matches the image below, use the Remove and/or Add buttons to correct any errors. When any errors have been corrected, click the OK button. 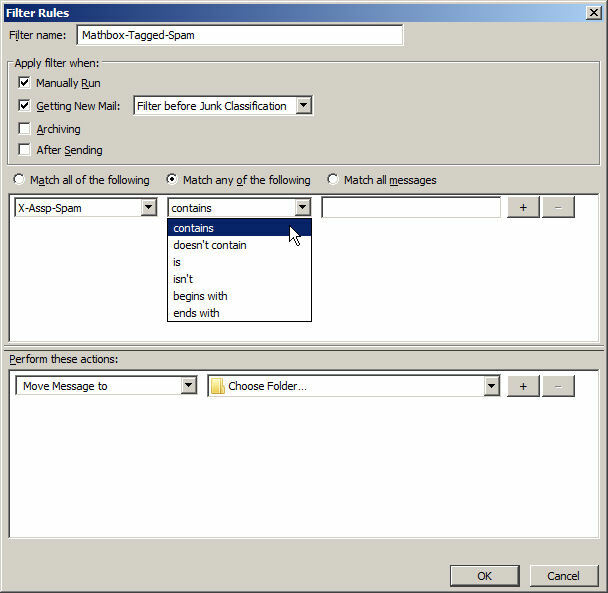 In the Filter Rule dialog, open the header select list. 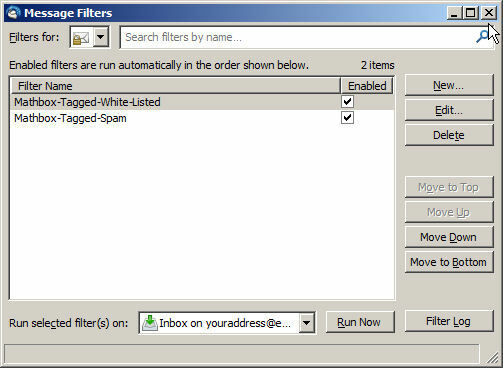 In the header select list, click X-Assp-Spam. 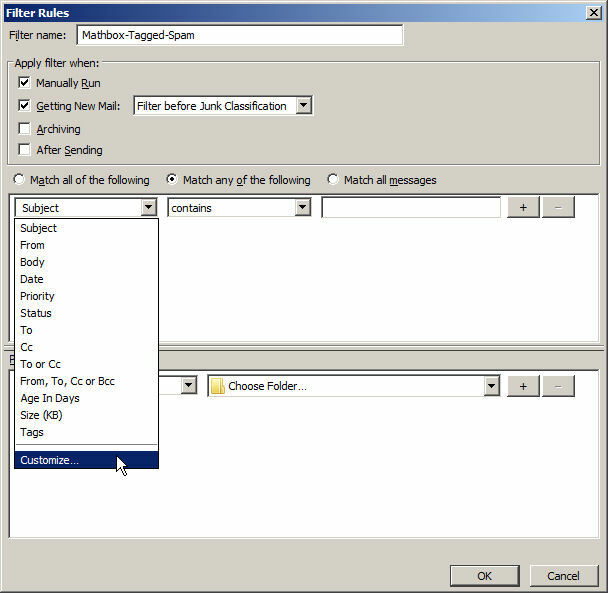 In the Filter Rule dialog, open the condition select list. 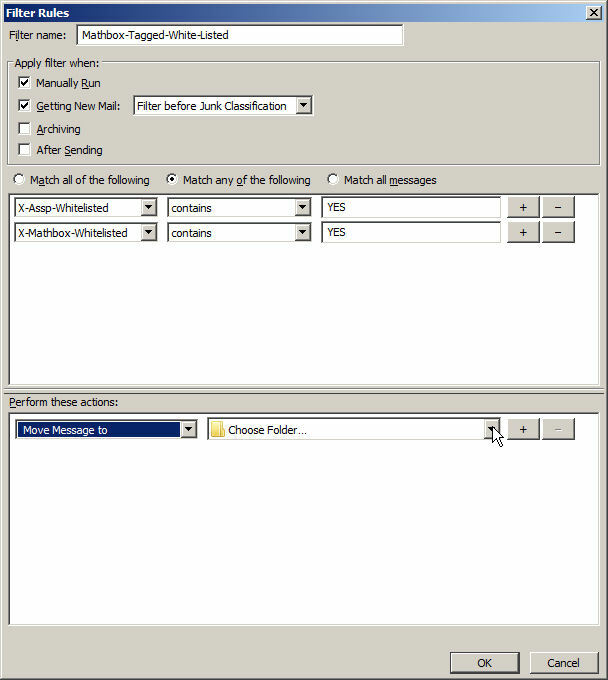 In the condition select list, click contains. In the value field, type YES. Then click the + (plus) button. 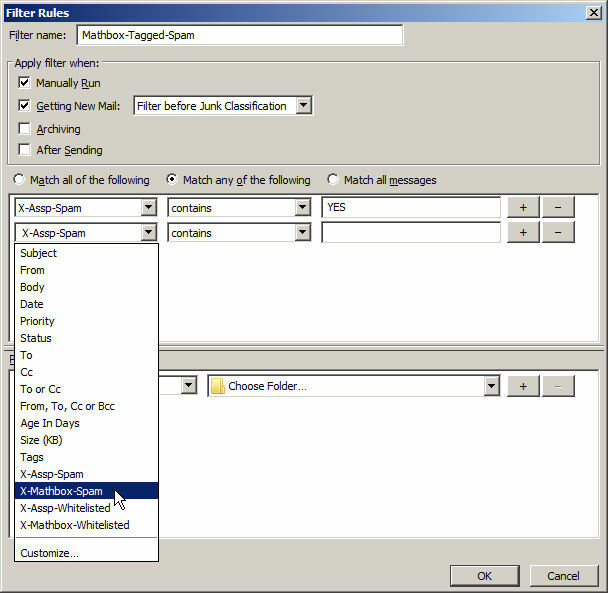 In the header select list, click X-Mathbox-Spam. In the value field, type YES. 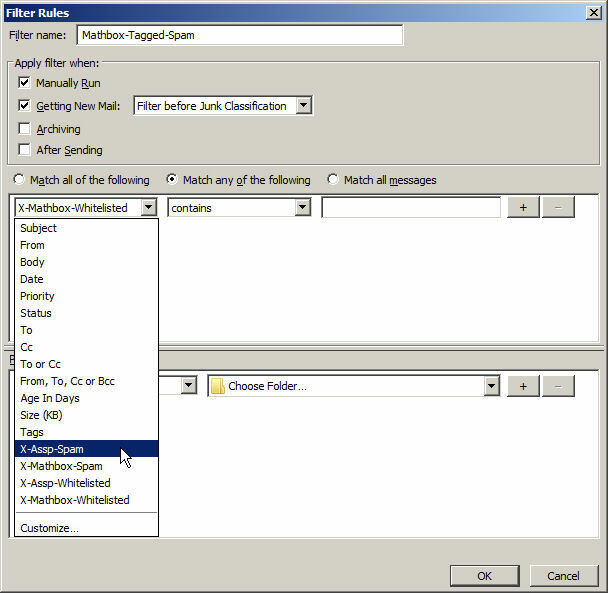 In the Filter Rule dialog, open the action select list. 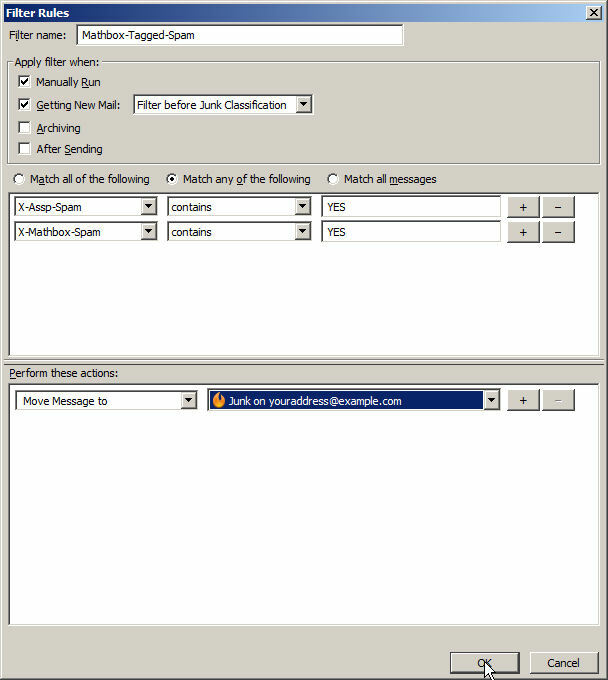 In the action select list, click Move Message to. 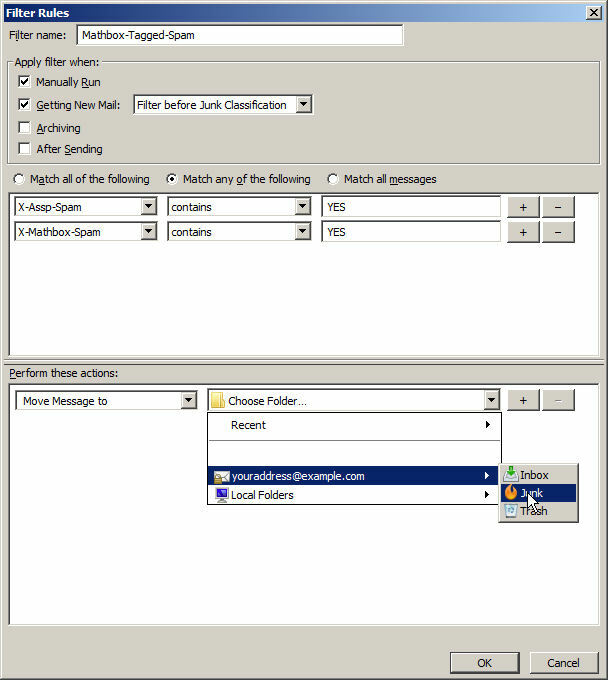 In the Filter Rule dialog, open the destination select list. 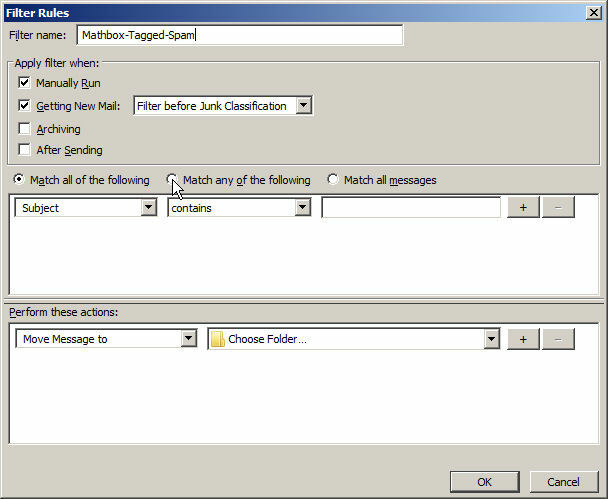 In the destination select list, click the email address you identified earlier in Step 6. 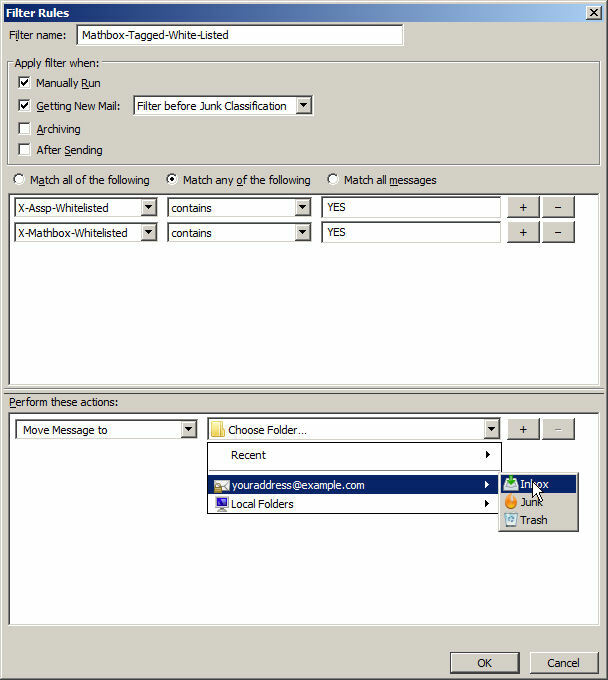 In the folder menu, click on the Junk folder. 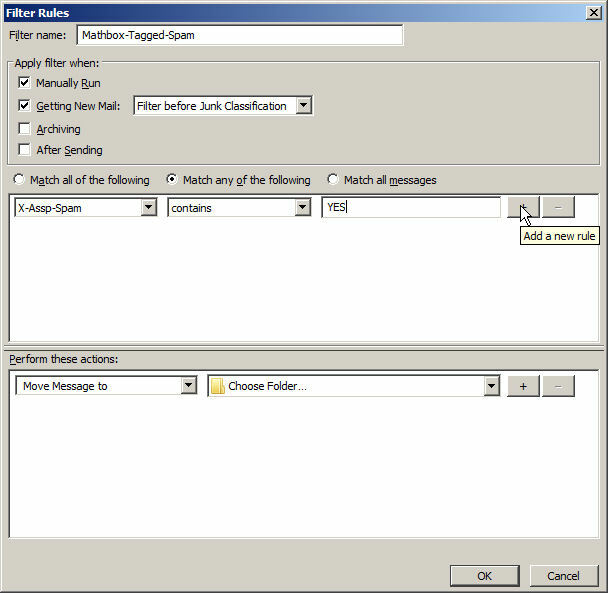 In the Filter Rule dialog, click the OK button. 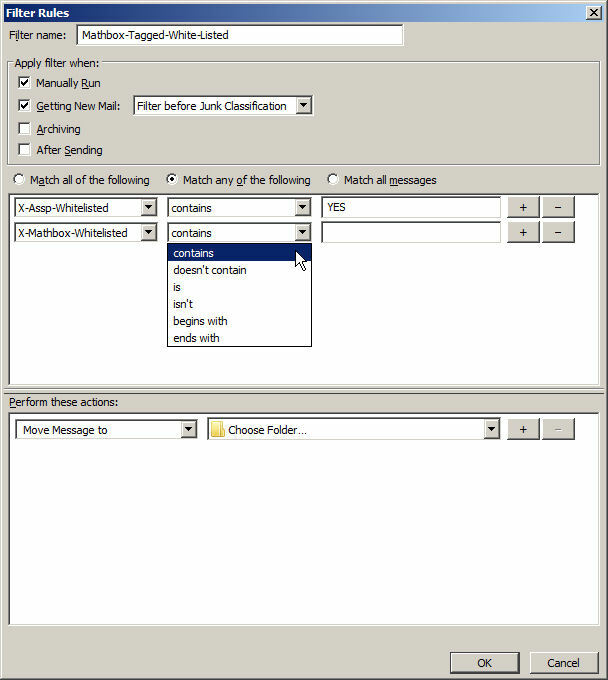 In this step, you will begin creating a white listed handling rule. Click the New button. 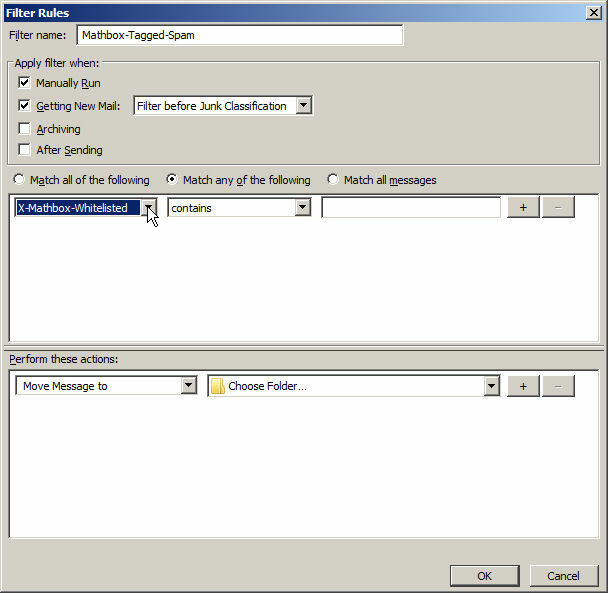 In the Filter Rule dialog, locate the Filter Name: text field and enter Mathbox-Tagged-White-Listed as the name of the rule. 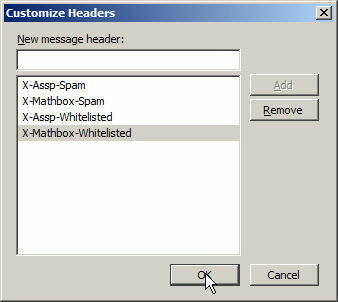 In the header select list, click X-Mathbox-Whitelisted. In the destination select list, click the email address you identified earlier in Step 6. 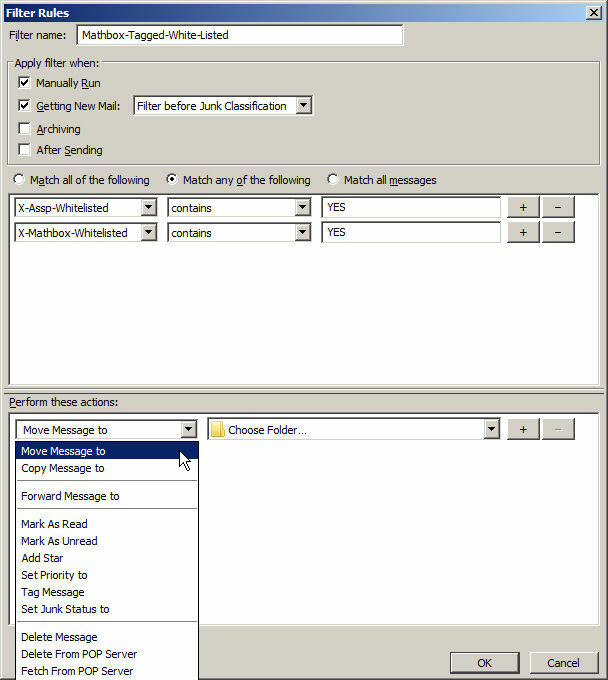 In the folder menu, click on the Inbox folder. In the Message Filters dialog filter list, the Mathbox-Tagged-White-Listed filter should be first in the list. If it is not, click that filter name to select it. 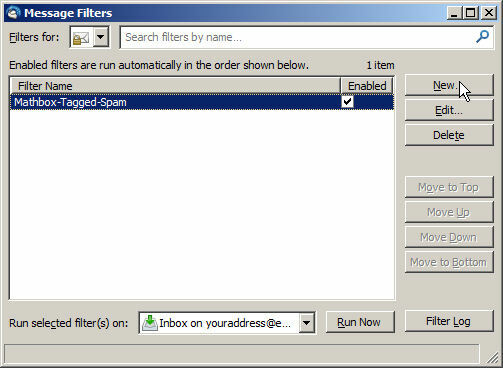 Then click the Move Up button to move it above the Mathbox-Tagged-Spam filter. If the order is correct, optionally, you can click the Run Now button to clean up your Inbox, then click the X (window close) button in the top, right hand corner.